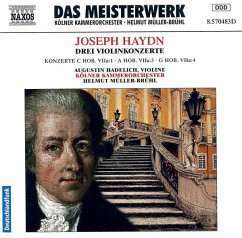 Der Artikel Joseph Haydn (1732-1809): Violinkonzerte H7a Nr.1,3,4 wurde in den Warenkorb gelegt. 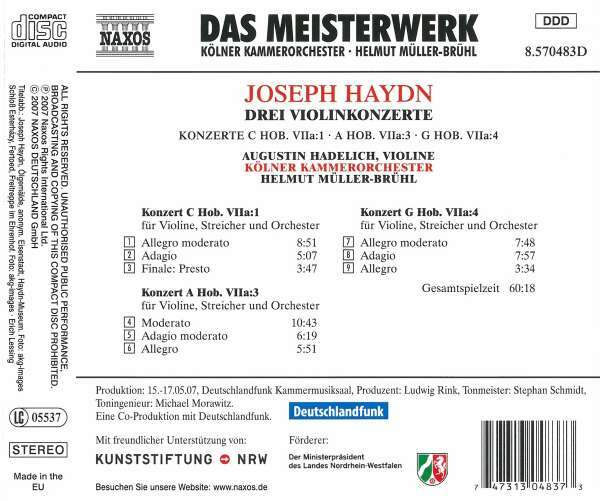 Of the nine violin concertos at one time ascribed to Haydn only four were genuine, and one of the four is lost. With their considerable use of the relatively higher register of the violin, chains of dotted notes, double stopping and ornamental figuration, the Concertos were written to showcase the considerable virtuosity of the principal violin in Haydn's orchestra, Luigi Tomasini. Gold medalist of the 2006 Indianapolis International Violin Competition and recipient of several of the competition's special awards, Augustin Hadelich has established himself as one of the most eloquent of the new generation of violinists.